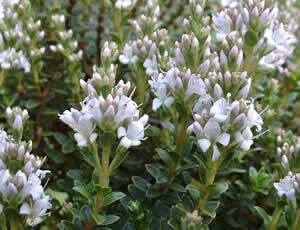 Hebe ‘Baby Marie’ (syn Hebe buxifolia Nana) is a compact bushy evergreen shrub, which grows to about 16 in (40 cm) high. The tiny, thick, spear-shaped green leaves are 0.25–0.3 in (6–8 mm) long. The flowers are lilac, late spring to early summer. This hebe cultivar is of unknown origin and was named after Marie Turnbull, a New Zealand botanical artist. Hebe odora is possibly one of its parents. Fairly hardy in the UK.